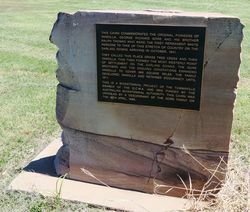 The cairn commemorates George and Ralph Gore who were the first permanent settlers of Yandilla. The Gores were from a family of Irish landowners. They came out to Australia as a family, largely for reasons of health, following the death of their father, a clergyman, and the youngest son. Another son, William, became the Rector of All Saints Parramatta, while Ralph and St George Gore travelled to the Darling Downs in 1841 with sheep purchased from the Macarthurs. They established a run at Grasstree Creek, later known as Yandilla, and were joined soon after by brothers, Robert and St John and their wives. 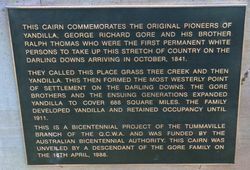 In 1846 Tummaville station adjoining Yandilla was acquired by the Gores. The family were devout Anglicans and had a paternalistic sense of responsibility towards the welfare of their workers, there being a considerable number of people living on Yandilla apart from the Gores. All Saints Church is a timber church erected at Yandilla Station by the Gore family about 1878. 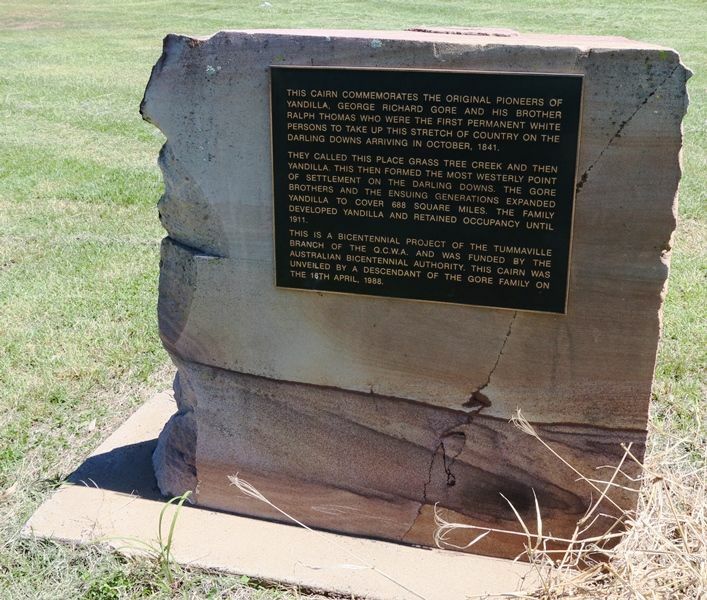 This cairn commemorates the original pioneers of Yandilla, George Richard Gore and his brother Ralph Thomas who were the first permanent white persons to take up this stretch of country on the Darling Downs arriving in October, 1841. They called the place Grass Tree Creek and then Yandilla. This then formed the most western point of settlement on the Darling Downs. The Gore brothers and the ensuing generations expanded Yandilla to cover 688 square miles. The family developed Yandilla and retained occupation until 1911. This is a Bicentennial Project of the Tummaville Branch of the Q.C.W.A. and was funded by the Australian Bicentennial Authority. This cairn was unveiled by a descendant of the Gore family on the 16th April, 1988.